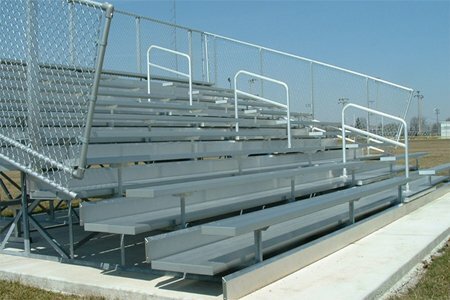 Our deluxe bleachers provide quality outdoor spectator seating at an affordable price. The center aisle of this bleacher makes them easier to navigate than sets without aisles. 3Row 21' L Deluxe Bleacher Seats 36 , 539lbs. 3Row 24' L Deluxe Bleacher Seats 42 , 609lbs. 3Row 27' L Deluxe Bleacher Seats 48 , 671lbs. 5Row 15' L Deluxe Bleacher Seats 42 , 1099lbs. 5Row 18' L Deluxe Bleacher Seats 52 , 1219lbs. 5Row 21' L Deluxe Bleacher Seats 58 , 1293lbs. 5Row 24' L Deluxe Bleacher Seats 68 , 1461lbs. 5 Row 27' L Deluxe Bleacher Seats 74 , 1583lbs. 5Row 30' L Deluxe Bleacher Seats 84 , 1742lbs. 8Row 15' L Deluxe Bleacher Seats 66 , 1775lbs. 8Row 18' L Deluxe Bleacher Seats 82 , 1948lbs. 8Row 21' L Deluxe Bleacher Seats 91 , 2083lbs. 8Row 24' L Deluxe Bleacher Seats 107 , 2371lbs. 8Row 27' L Deluxe Bleacher Seats 116 , 2566lbs. 8Row 30' L Deluxe Bleacher Seats 132 , 2820lbs. 10Row 15' L Deluxe Bleacher Seats 82 , 2229lbs. 10Row 18' L Deluxe Bleacher Seats 102, 2439lbs. 10Row 21' L Deluxe Bleacher Seats 113, 2613lbs. 10Row 24' L Deluxe Bleacher Seats 133, 2983lbs. 10Row 27' L Deluxe Bleacher Seats 144, 3225lbs. 10Row 30' L Deluxe Bleacher Seats 164, 3552lbs.